The international press, Dr Vino and several other sources all reported yesterday that, as a result of Croatia’s imminent accession to the European Union at the end of a 10-year long process, Croatian wineries will be required to stop using the name “Prosek” to identify a traditional local sweet raisin wine that has been made for centuries mainly in the Dalmatia region from local grape varieties such as Bogdanuša, Maraština, Plavac mali and Pošip. The reason for the requirement is that, according to EU officials, the name of the Croatian wine is too similar to Italy’s Prosecco and therefore it might be confusing to consumers. And this in spite of Prosek and Prosecco being two very different wines, made out of different grapes (Glera for Prosecco and the Croatian grape varieties mentioned above for Prosek) and in different styles (Prosecco is mostly sparkling and is not a sweet wine, while Prosek is a still, sweet raisin wine). Unsurprisingly, the EU requirement has caused considerable commotion in the Croatian wine world and some producers indicated that the Croatian authorities are even considering initiating a legal dispute to challenge the EU requirement. However, the chances that Croatia be allowed to retain its right to use the name “Prosek” for their wine after joining the EU are very slim, as the case is virtually identical to the one that a few years ago prevented Italian winemakers (mostly in Veneto and Friuli) from using the word “Tocai” to identify a local dry wine that had been made for centuries from the homonymous grape variety because the name was too similar to Hungary’s Tokaji, a famous local sweet raisin wine made from Furmint grapes (for more information about the Tokaji/Tocai dispute, please refer to my previous post over at Flora’s Table that dealt with it). But, as the saying goes, bad news never comes alone, at least for Croatia, that is. Beside the Prosek debacle, Croatia has to face a claim made by neighboring Slovenia that Croatia should also be prevented from using the word “Teran” to identify a red wine that is made in Italy’s region of Friuli, in Slovenia and in Croatia from the grape variety known as Terrano or Teran in Croatia. Slovenia’s claim is based on the fact that the EU granted Slovenia a protected designation of origin for Terrano grapes grown in the Slovenian region of Kras. The European Commission very recently decided the Teran dispute in favor of Slovenia, with a decision that will likely also negatively affect Italian Terrano producers. Even in this case, the decision gives rise to many doubts, as Terrano is a very ancient variety (the oldest references date back to 1340 in Slovenia) which originated from the Karst plateau, an area that is shared among Italy (Friuli), Slovenia and Croatia (Istria). DNA profiling has also proved that Terrano is identical to Refosco d’Istria (a Croatian variety) and Refosk in Slovenia (information on the Terrano grape variety, cit. Wine Grapes, by Robinson-Harding-Vouillamoz, HarperCollins 2012). Given the above, which side of the fray are you on? This entry was posted in Wine, Wine Education, WiNews and tagged Croatia, Italian, Italy, news, Prosecco, Slovenia, Terrano, wine on May 7, 2013 by Stefano. NOTE: this post was originally published in Flora’s Table on October 12, 2012, hence the historical references below. 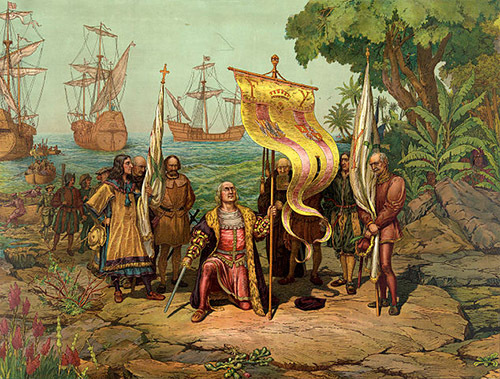 On October 12, 1492, precisely 520 years ago, Italian world-known explorer and sailor Christopher Columbus and his expedition set foot in the Americas (on the island of San Salvador in the Bahamas) in Columbus’s first voyage to the New World. Since Columbus was born in Genoa, Italy (which, coincidentally, is also where I was born, “just” a few centuries later!) I think it makes sense that I honor the memory of that event by providing our readers a quick overview of the best wines from the Italian region of Liguria (of which Genoa is the capital). Liguria is a narrow strip of mostly mountainous land in the Northwest of Italy facing the Ligurian Sea. Because of its geography and its relatively small size (about 2,100 sqm/5,420 km, which makes it the third smallest region in Italy), agriculture in general and viticulture in particular have traditionally been challenging for its residents – so much so that in the coastal areas of Liguria vines are grown on artificial terracing, a typical method of cultivation. Nowadays, Ligurian wine grape acreage is about 3,645 acres (1,475 HA), approximately 50% of which are part of the eight DOC appellations of Liguria, and total production of wine stands at about 2.64 million gallons (100,000 HL). On average, quality of Ligurian wines has not been outstanding. 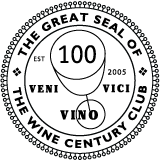 However, over the last decade or so there has been a serious effort on the part of select producers to invest the required energy and resources to produce top quality wines and, as a result, there are now a limited number of commendable wine makers who attained excellence in at least one of their wines. Let’s take a quick look at a sample of just a few of the top wines that are part of these “best of the crop” wineries (incidentally, all of the wines in our overview earned the prestigious “5 bunches of grapes” top rating in the 2,000 Wines Guide made by the Italian Sommelier Association). Two of the best grapes that have traditionally been grown in Liguria to make white wine are Pigato and Vermentino, the former being cultivated exclusively in Liguria and the latter being the most planted white-berried grape in such region. Vermentino originated in the Middle East, was brought to Spain and from there made its way to Italy where, among other places, it was widely planted in Liguria and Sardinia. An outstanding winery for Pigato is VisAmoris, whose Riviera Ligure di Ponente Pigato Verum 2011 DOC is without a doubt the best Pigato I have ever tasted so far – it undergoes a short phase of maceration on the skins in order to maximize the extraction of the aromas, which results in an intense and seducing bouquet of apple and herbs and a good balance in the mouth between its acidity and minerality on the one hand and its smoothness on the other. Another producer of excellent Pigato wine is Bio Vio, whose top wine is the Riviera Ligure di Ponente Pigato “Bon in da Bon” DOC. This is a dry white varietal wine made of 100% Pigato grapes, with good acidity and pleasant scents of peach, sage, mint and minerals. One outstanding Vermentino is the Colli di Luni Vermentino “Boboli” DOC from wine maker Giacomelli. The Boboli is a dry white wine made of 95% Vermentino and 5% Malvasia di Candia grapes, with delicate aromas of citrus, grapefruit, algae, honey and pine resin, as well as good acidity. In the best Ligurian tradition, both the Pigato and the Vermentino are wonderful pairings for fish/seafood dishes, typical cheese focaccia or trofie or trenette pasta with pesto, potato and string beans. Also, both wines that we just recommended have a very good price/quality ratio. Probably, the best Ligurian black-berried grape is Rossese, whose origins date back to at least the XV century, but other than that remain fairly obscure. 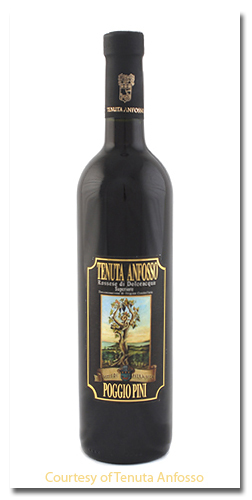 A very good Rossese that is certainly worth a try should you come across a bottle, is the Rossese di Dolceacqua Superiore “Poggio Pini” DOC from producer Tenuta Anfosso. This is a dry varietal red wine made of 100% Rossese grapes with fairly noticeable tannins and nice scents of rose, blackberry, strawberry jam, pepper and cinnamon. It pairs well with meats, such as lamb chops or goat dishes, and for a quality wine it is surprisingly quite affordable. Finally, in the Ligurian appellation Cinque Terre DOC one can find one of the least known and most delicious sweet white raisin wines in Italy, the Sciacchetrà (this is pronounced something like “Shackaytra”). One of the best Sciacchetrà you can have the delight to enjoy is the Cinque Terre Sciacchetrà Riserva DOC of the Capellini winery. This sweet, golden raisin wine is made out of 80% Bosco, 10% Vermentino and 10% Albarola white-berried grapes and gives out pleasant scents of honey, dried apricot, citrus, rosemary and dates. It can be enjoyed by itself, as a meditation wine, or coupled with a traditional Ligurian dessert, such as pandolce (the Ligurian take of panettone) or canestrelli (a kind of flower-shaped cookies). Given the very limited yield of this wine, its price is pretty steep, but if you can afford it, you will not regret paying it once you have a sip of Sciacchetrà in your mouth! As usual, any remarks or experiences you want to share with all of us on the wines of Liguria are very welcome: just leave a comment below! This entry was posted in Wine, Wine Reviews and tagged Christopher Columbus, Cinque Terre, Cristoforo Colombo, Italy, Liguria, Pigato, Rossese di Dolceacqua, Sciacchetrà, Vermentino, wine on February 4, 2013 by Stefano.